While out and about in December, I stumbled across these. For sure, you know they would jump off the hanger and into my cart. I'm very skeptical of things which say they are Dr Pepper flavored. Witness Lip Smackers Dr Pepper flavored lip balm. It smells okay, but the actual flavor is not real close. You do have to use your imagination a bit to find the flavor. Still, it's important that I conduct a taste test so you don't have to. I opened the package and was immediately struck by the aroma of warm, stale Dr Pepper. Well, I guess that's something to be said for them. There was a Dr Pepper scent. Typical licorice strands. They were dark, almost black. 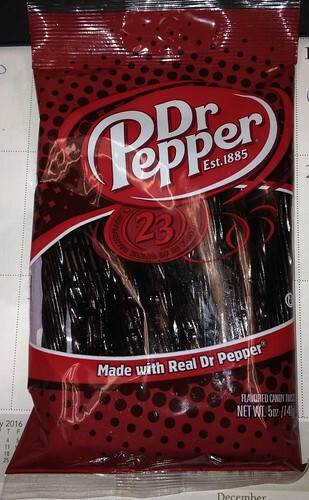 In a grouping with black licorice, it would be difficult to tell them apart, although the Dr Pepper ones had a more glossy sheen and were not the coal black you're used to in black licorice. Taste? My initial impression was not wrong. They tasted like warm, stale Dr Pepper-tinged paper. I love cherry licorice. If you buy Twizzlers cherry or even Red Vines licorice, the cherry is an intrinsic part of the candy. In a way, it felt as if the Dr Pepper licorice had been produced without flavor and then someone got the bright idea to soak them in the soda or spray the soda onto strips of unflavored candy. The Dr Pepper was gone after a couple bites. Now, it can be argued, rightly, that "licorice" is an anise-flavored confection and anything other than what we identify as "black" is not "licorice" in the truest sense of the word. I think we have embraced the word to define things in this above shape or in the bite size, which is really just the above shape cut into pieces. As such, this really isn't "licorice" so much as a candy trying to tie in with Dr Pepper or Dr Pepper trying to tie in with a candy. As a novelty, it was okay. If I found this bag on sale for a buck, I might be tempted, but at the regular price of $2.69, it's too pricey for what I got. If you like Dr Pepper, as I do, it's worth it to try it. Beyond that, save your change and buy a case of the real thing, sit it out on your deck in the winter and enjoy it ice cold. Partially frozen is even better.